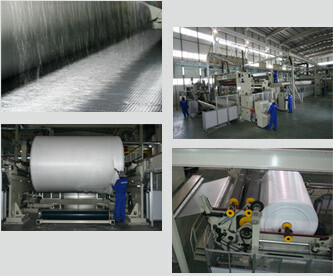 General nonwovens produce thermally point bonded spunbond nonwovens made of polypropylene and polyester. The multi-beam line using sophisticated process control methods able to achive a high degree of uniformity and coverage. With various fabric finishing, consolidation and downstream technologies employed, the fabric characteristics and performance can be optimized to suit your specific needs from very uniformly distributed soft touch fabrics to fabrics with thick filaments leading high strength and stiffness. Hydrophilic, anti-static, anti-bacterial, flame retardant, UV resistant, colored fabrics, soft touch fabrics, stiffened fabrics, optical brightened fabrics are available. The filament fineness is an important factor that affects the fabric characteristics. General Nonwovens is capable of producing fabrics from subdenier -micro- filaments of 0.7 dpf (denier per filament) to high denier filaments up to 5 dpf. The low denier filaments, with their smaller diameter, produce more surface area and more length per unit weight, reduce light transmission and improve light dispersion (greater opacity) and softness (due to lower unit fiber deflection forces). Sub-denier spunbond fabrics would extend a great value to filtration, diaper covers, medical and personal hygiene products requiring liquid and particulate barriers that are breathable and provide good vapor transport with significant air permeability. The fine spunbond filaments render a soft and pleasant feel while the high denier filaments, with their higher diameter, produce an improved strength and physical properties on both directions of the fabric. Number of filaments per web width can be set to suit your fabric characteristics and performance requirements. Thanks to the technology employed, the filament fineness and unique filament lay-down system allows General Nonwovens be able to offer nonwovens at a lower basis weight performing at least the same as a traditional nonwoven at a higher basis weight. Let General Nonwovens Team to show the potential savings you can make!